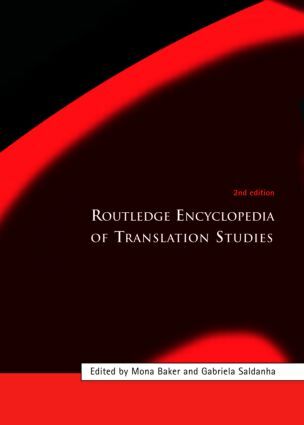 The Routledge Encyclopedia of Translation Studies has been the standard reference in the field since it first appeared in 1998. The second, extensively revised and extended edition brings this unique resource up-to-date and offers a thorough, critical and authoritative account of one of the fastest growing disciplines in the humanities. The Encyclopedia is divided into two parts and alphabetically ordered for ease of reference. types of interpreting (e.g. signed language, dialogue, court). New additions in this section include entries on globalisation, mobility, localization, gender and sexuality, censorship, comics, advertising and retranslation, among many others. Part Two (History and Traditions) covers the history of translation in major linguistic and cultural communities. It is arranged alphabetically by linguistic region. There are entries on a wide range of languages which include Russian, French, Arabic, Japanese, Chinese and Finnish, and regions including Brazil, Canada and India. Many of the entries in this section are based on hitherto unpublished research. This section includes one new entry: Southeast Asian tradition. Drawing on the expertise of over 90 contributors from 30 countries and an international panel of consultant editors, this volume offers a comprehensive overview of translation studies as an academic discipline and anticipates new directions in the field. The contributors examine various forms of translation and interpreting as they are practised by professionals today, in addition to research topics, theoretical issues and the history of translation in various parts of the world. With key terms defined and discussed in context, a full index, extensive cross-references, diagrams and a full bibliography the Routledge Encyclopedia of Translation Studies is an invaluable reference work for all students and teachers of translation, interpreting, and literary and social theory. Mona Baker is Professor of Translation Studies at the University of Manchester, UK. She is co-founder and editorial director of St Jerome Publishing, a small press specializing in translation studies and cross-cultural communication. Apart from numerous papers in scholarly journals and collected volumes, she is author of In Other Words: A Coursebook on Translation (Routledge 1992), Translation and Conflict: A Narrative Account (2006) and Founding Editor of The Translator: Studies in Intercultural Communication (1995), a refereed international journal published by St Jerome since 1995. She is also co-Vice President of the International Association of Translation and Intercultural Studies (IATIS). Gabriela Saldanha is Lecturer in Translation Studies at the University of Birmingham, UK. She is founding editor (with Marion Winters) and current member of the editorial board of New Voices in Translation Studies, a refereed online journal of the International Association of Translation and Intercultural Studies, and co-editor (with Federico Zanettin) of Translation Studies Abstracts and Bibliography of Translation Studies. Part I (General) Entries include: central issues in translation theory (e.g. equivalence, translatability); terms which have a specific meaning in translation studies (e.g.imitation, paraphrase); various approaches to translation (e.g. linguistic perspective, interpretive approach); types of translation and interpreting (e.g. literary translation, dubbing, and signed language interpreting) Part II (History and Traditions) Entries include Russian, French, Arabic, Japanese, Chinese and Finnish, and regions including Brazil, Canada and India. Mona Baker is Professor of Translation Studies at the University of Manchester, UK. She is co-founder and editorial director of St. Jerome Publishing, a small press specializing in translation studies and cross-cultural communication. Apart from numerous papers in scholarly journals and collected volumes, she is author of In Other Words: A Coursebook on Translation (Routledge 1992), Translation and Conflict: A Narrative Account (2006) and Founding Editor of The Translator: Studies in Intercultural Communication (1995- ), a refereed international journal published by St. Jerome since 1995. She is also co-Vice President of the International Association of Translation and Intercultural Studies (IATIS).